Currently, WP/LR Sync is going through many changes. This tutorial about the extensions will be completely reviewed very soon. Basically, all the extensions shipped with the plugin will be removed and available through the WordPress Repository instead. Also, Basic Collections will disappear and Post Types will become WP/LR Theme Assistant (as it is getting more and more powerful). Extensions are the glue between WP/LR Sync and gallery plugins or the themes. However, you don’t need those extensions if you are only synchronizing with the Media Library. Make sure you also read the introduction on the main page of WP/LR Sync before reading this. The extensions are available in your admin in WP/LR Sync > Extensions. You will see a screen that looks like the one below. In the screen above, the Post Type internal extension has been checked. Notice the message at the top of the screen. This extension is loaded and working. Extensions can also automatically be created and loaded by a theme or another plugin, in that case, that message will also display that information. Select one (or more) extension(s) and click Save Changes. Then click on Resync with Extensions. WP/LR Sync will share all the information (about the collections, folders, keywords and so on) to this extension and everything you need will be automatically created. Then, from now on, everything will be kept in sync through those extensions as well. I noticed a few of my users were selecting all the extensions. Please note that you don’t need any extension at all for WP/LR Sync to work, you only need it if you want something more than just synchronizing with your Media Library. And if you do, you probably need one extension, and this extension is often Post Types. An extension can add a menu to your WP/LR Sync menu so make sure you check it out. In the case of the Post Types extension (which is a powerful one), there is a new menu. Check the options for it. There is also a little presentation of this extension here. Not happy with an extension? You can Reset with Extensions to remove all the data created by this extension, switch to another one, save, then Resync with Extensions again. 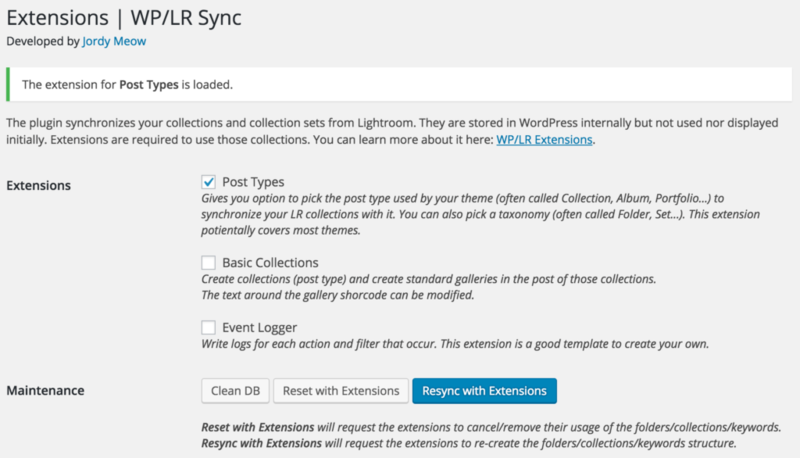 It is very easy to switch between extensions (and therefore, to switch between themes or gallery plugins) with WP/LR Sync. That way, you can also test and play as many themes are you want without having to re-create everything by yourself. Once you are happy with an extension, just forget about WP/LR Sync. It will keep your WordPress synchronized with your Lightroom naturally. With this extension, you will be basically able to sync most themes’ post types and taxonomies automatically. Folders and collections from LR can create those post types and taxonomies and even re-use existing ones. It’s a very powerful extension so there is a special tutorial about it here: Post Types Extension. This extension creates a new post type called Collection. Your collections and sets will be replicated in in WP with the same hierarchy. The title will be kept synchronized the one you are using in LR. This extension is quite simple and is meant to be used as an example. You can look at its code and adapt it to your needs. Maybe you know the Real Media Library plugin, it is similar but better looking to WP Media Folder: it adds a way to browse the photos in a nicer way in the Media Library. For it to work magically with WP/LR Sync, you will need the WP/LR Sync Folders extension, it is available on the WordPress repository. I don’t keep track of all external extensions but some people sometimes ask me for those. Also, I can’t provide support on this personally, so you need the help of a developer or of the original plugin maker. WP Media Folder: This plugin is used to browse your photos more easily. It basically creates virtual folders and let you organize your Media Library. The plugin is on Joomunited.com. The extension is available on GitHub. NextGen: Popular (but really ancient / not recommended) gallery plugin. The extension is available on GitHub. Since NextGen is a bit specific (~= old) and doesn’t use WordPress either naturally or properly, the extension might break at any time. I don’t recommend using it but feel free to give it a try (some of my users are actually using it). Photo Gallery: I am not sure the extension is working but the code for it is on GitHub. Feel free to hack on it. I like to collaborate with other developers to make things even more compatible. Today, WP/LR Sync is very mature and perfectly stable but of course, there is always room for improvement. Let me know if anything crosses your mind. I’ll be always here to help and make things better.